On April 23, 1934 The News published an article written by Miss Mary L. Percy about Abram Frederick Biggers, Lynchburg’s first school superintendent. Using some quick census records from the Internet, I discovered that Percy was forty-two in 1900 and a teacher at the School for the Deaf and Blind in Staunton, Virginia. In 1910, she was living in a boarding house on Washington Street in Lynchburg and teaching public school. Ten years later, she was boarding in Campbell County and teaching at a private school. By 1930, at age seventy-two, she was living on Cabell Street and was the head of her own household. When she wrote this article she was around seventy-six years old, having been born around 1858. Percy’s original article is reprinted here, with some of my notes interspersed to provide additional background. Essentially, I have used her article as an outline and surrounded it with more information about Superintendent Biggers and Biggers School. All of the pic­tures have been added by me, along with sidebars and footnotes. My interest is personal. I lived across the street from Biggers School, which was on the corner of Fifth and Clay streets, and attended the school from first through seventh grade, starting in the fall of 1944. But I am getting a little ahead of myself. Gene W. Tomlin is a Lynchburg native and life-long history buff. After graduating from Lynchburg College in 1960, he spent the next thirty-five years as a professional YMCA director serving associations in Florida, Tennessee, Alabama, Kentucky, California, and South Carolina. He moved back to Lynchburg in 2002 and is enjoying rediscovering his hometown. 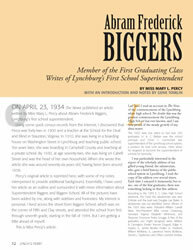 This article was excerpted from Tomlin’s book Abram Frederick Biggers and Biggers School (Warwick House, 2007). It has been edited for Lynch’s Ferry readers.